The last time I went to Kolkata I came back with a few treasures. Nothing fancy, just stuff that my mother and her mother before her used in their kitchens. An assortment of bowls, glasses and little platters, all in bell metal or kansha. Kansha is widely used in Bengal and one of the highlights of our summer vacations in Kolkata was eating out of the shiny golden plates and drinking out of the heavy curved kansha glasses. I would often demand an elaborate meal just to eat out of the whole set - the plate in the centre piled high with hot rice with a blob of ghee or butter, a ball of aloo bhate or mashed potato mixed with mustard oil on one side, a couple of slices of begun bhaja and even a little pile of crisp fried uchhe or karela. There would be a line of gleaming kansha bowls arranged around the plate - daal, sukto, machher jhol, aloo/potol/jhinge posto, mangsho'r jhol, chatni... a full fledged Bong feast for the thoroughly spoiled grand daughter! I couldn't bring back more than a few as these vessels are quite heavy. However, Mom arrived with as many as she could carry and now I have quite a collection. On my next trip to Kolkata we plan to go through my Didin's (grandmom's) camphor chest and I will have pick of the treasures within. Among the pieces Mom has brought is a wide open mouthed bowl called a kanshi. I remember this, and many more like it, being used every day. 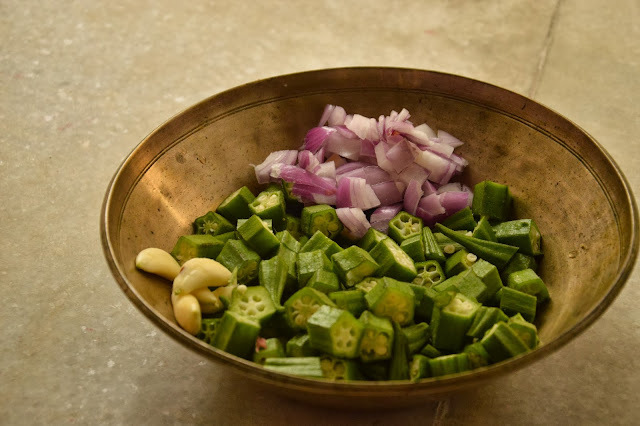 Didin would collect the sliced or chopped vegetables in these (sometimes all the requirements would be piled up in one) and the kanshi would also make an appearance on the dining table with a jhol or torkari in it. Since it has a flat base and a wide open mouth the kanshi was often used to serve machher jhol or fish curry - the shape was convenient as the delicate fish pieces would be easier to lift out and serve without breaking. The kanshi that has come to me has become a part of my daily cooking utensils. Every time I use it I feel connected to Didin, my Mom, and to the many women before them who have handled the very same kanshi. 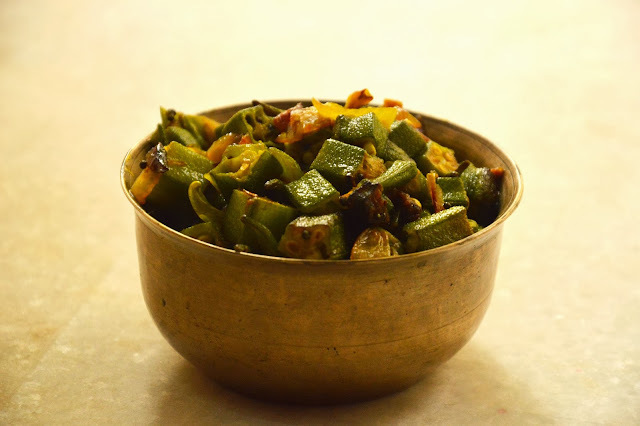 Today I made a typical Dhyarosh Bhaja or fried ladyfinger/bhindi among other things for lunch. Of course I used the kanshi to pile up my prepped veggies and then brought out one of the kansha batis or bowls to serve the finished dish. This preparation is one I saw very often at Didin's house. Incredibly simple with just a few ingredients, this is a fine example of Bengali vegetarian cuisine where simplicity and flavour go hand in hand. Usually served with daal, dhyarosh bhaja is just one of the many varieties of bhaja (fries) that accompany daal in a traditional Bengali meal. Once you have prepped your veggies heat mustard oil in a kadai or wok. Add the mustard seeds and let them crackle and pop. Then chuck in the chopped garlic and reduce the heat so the garlic doesn't burn. Add the green chilli. After a minute increase the heat and then add the onions and the bhindi to the hot oil. Stir around nicely and let it all fry. Sprinkle turmeric and salt and mix. reduce heat to medium and cover the wok and let it cook for 2 -3 minutes. Open lid and stir. Cover again and leave it to cook. Check after a few minutes and ensure that it doesn't burn. Give it a stir every time you have a look. 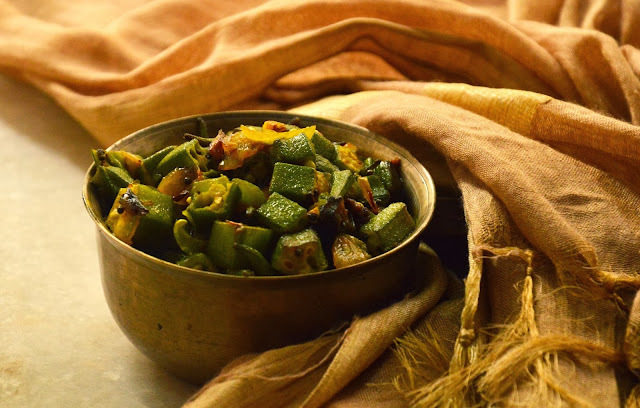 Once the bhindi is cooked your Dhyarosh Bhaja is ready. Serve with hot rice and daal. Yum Rhea. Loved the post and the vegetable. Oye Kake! A Very Good Reason to Balle Balle!